Formal Name: Confederacy of Bjørgvolsa. Size of Domain: Most if not all of the island of Nordind and the coast to the east. Technology Tags (Positive): Farming, animal husbandry, Whaling, Shipbuilding, armor crafting, Weapons + Armors enchanting, Navigation by sea. Technology Tags (Negative): Magic of any sort besides enchanting, ranged weaponry, weapon crafting. Adult male -- 10-11 feet tall. 600-700 pounds. Contrary to belief, not inherently aggressive by nature. Adult female -- 9-10 feet tall. 500-600 pounds. Giants are massive humanoids with a highly developed and dense muscular structure, a resistant to pain, and resistance to harsh, cold temperatures. Giants are believed to be the descendants of humans, though their official origin is shrouded in history. The most differing traits from humans to giants are the large upper and lower canines, adapted to their carnivorous appetite. They are also known for their blood chilling, inhuman roars. And a lesser obvious fact, their immune system is very strong. And along with having a large appendix, they can digest raw food. Some of them however are pure ice giants, a rare breed of giant with blue-ish skin and are cool to the touch, if not icy. They are extremely rare, and most of them live in the city of Bjørgvolsa. Clothing: Heavy, pelt and fur clothing. Kingdom Name: The Kingdom of Bjørgvolsa. Kingdom Type: Ice, mountains, fjords, forests. Kingdom Geological Analysis: Steel, iron, limited amounts of mithril and silver. Kingdom Description: The Confederacy of Bjørgvolsa is a small country of villages and towns connected by the capital city of Bjørgvolsa. The northern end of the island is mostly mountains and fjords, while the further south you go, the more the dense woodland takes over. Finally you have the southern coast, which is comprised mostly of rocky shores and plains. Culture: Giants come from a clan-based warrior background. Their culture is immersed in celebration and tradition. They believe that they emerged from the powerful and torrents of the northern sea, though some believe in the stories of the curse. Their celebrations can be as exotic and different as donning stag-head skulls and dancing around fire, to the hearty celebrations of a large table filled with food and alcohol. While it may be assumed being a warrior of the highest honor in the society, a profession like blacksmith or a sea captain can easily be more respectable. That being said, their culture does not revolve around violence. The Nordindic ice bear is also revered in societies and are often bred by nobles. History: The Giants' origin is unknown, but it is speculated that they were cursed and exiled humans from the coasts surrounding Nordind. Giants first appear in early history as Viking raiders and pirates. They raided the coasts to the southeast, south, and southwest of the island of Nordind. The giants were not united and strong clans often warred with each other. During one such massive clan war, the coastal clans rose up against the Viking giants of the island of Nordind. They invaded Nordind and set the villages and towns to the torch. The Great Viking War redefined the giant civilization, and brought it into a recessive, isolationist period. While pirate raiders still remained, they were far less in number. 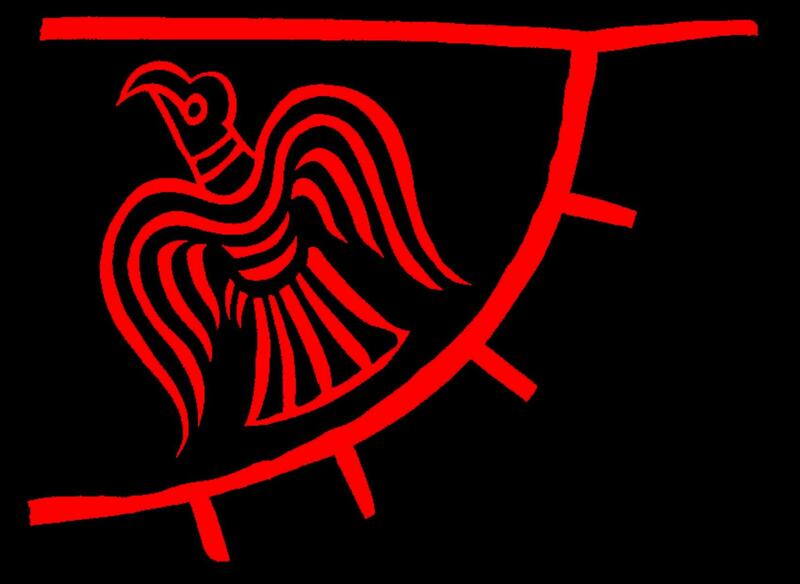 In the centuries to follow, the Vyrnson clan, which had originated from the great city-state of Bjørgvolsa, rallied what clans they could, and started a massive unifying campaign. Those who joined benefited from the shared resources and protection. Those who opposed were met with an army of over 20,000. The period known as the Unification lasted 11 years. Gothi Iorek Vyrnson, leader of his clan, united all the 9 giant clans, either allying or slaying their Gothi. He was crowned King of Bjørgvolsa. He returned island to its former glory, warred against nations that enslaved the giant to exploit his raw strength, established trade and diplomacy, and gave the giants a national identity and pride. He has long since been dead, but his work in uniting his people will never be forgotten as long as the Kingdom is united. Religion: The Giants believe the island of Nordind was a great sea-beast that was slain by the Father of Giants, Kontar. The sea-beast had a thirst for the fledgling race's blood, and sought to extinguish the first giants. Kontar, Lord of the Giants and war, slayed the beast in hand to hand combat. The Giants worship and pay sacrifice to the Elder Giants, 9 God-like beings with their own profession and clan. Allegiance (if any): Good, to her country. Appearance: Standing at 9'6'', usually wearing a heavy fur cloak with traditional Viking armor underneath. Her head is usually freshly shaven, she has light blue eyes, purple/bluish skin, and many scars on the hands and a few prominent ones on her face. Kluge's past is a mystery, though there are rumors that she was daughter to a coliseum slave. She is a stalwart, stubborn, and cynical individual who doesn't often partake in outwardly showing emotions. 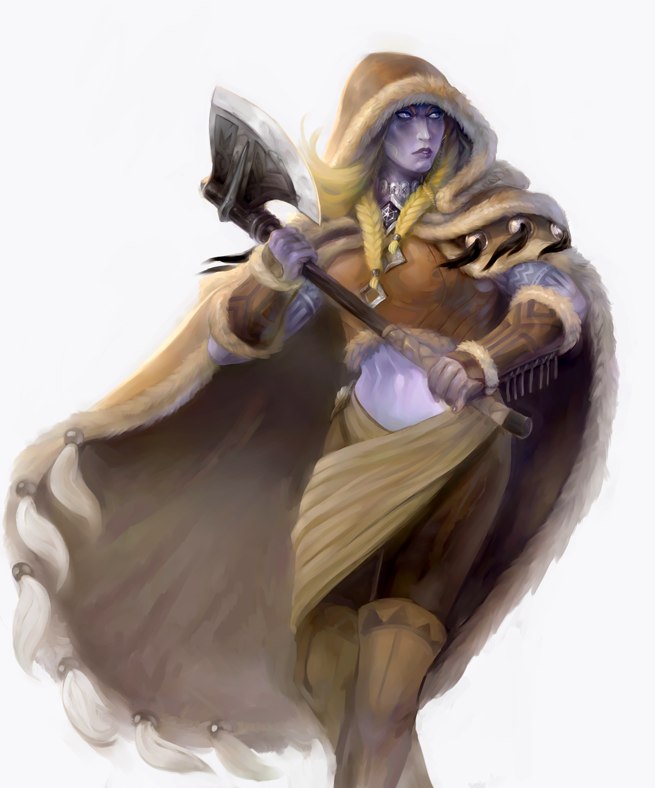 Her reputation as a hand to hand fighter and axewoman outdoes her social flaws, as she is a hero of the clans, who has slayed many who opposed her people.